Information about Bob Harris Custom Cues. Bob Harris pool cue valuations, Bob Harris cue identification, etc., including a listing of all Bob Harris pool cues which can be used to research old Bob Harris Custom Cues or identify a Bob Harris pool cue. A historical database and listing of Bob Harris pool cue model numbers and other information about Bob Harris Custom Cues. Below is an archive of Bob Harris cues. You'll find retired Bob Harris cues as well as current Bob Harris cue series, and one-off custom Bob Harris Cues. Below is a list of Bob Harris Custom Cues or one-off products which don't belong to a specific product line. Bob Harris Custom Cues Logos. Past and current Bob Harris Custom Cues logos, marks, symbols, and identifiers. 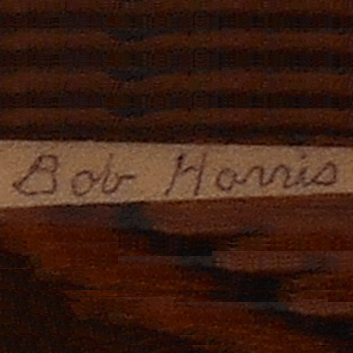 A photo of Bob Harris' signature from one of his Bob Harris Custom Cues brand pool cues. This Bob Harris Custom Cues signature is common on most of his pool cues from 2004 through 2014. A logo from Bob Harris Custom Cues brand pool cues. 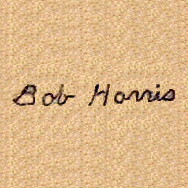 This Bob Harris Custom Cues logo is basically Bob Harris' signature. Bob Harris Custom Cues pictures and photos. A picture of an archive of pool cues from the Bob Harris Custom cues made from 2004 and 2014. It can be used to identify Bob Harris Custom Cues and find out how much Bob Harris pool cues are worth. Bob Harris is a custom cue maker from Richmond, KY.
Bob started making Bob Harris Custom Cues in early 2000 (though there are a few earlier examples, e.g. circa 1996, of cues by Bob Harris from before he went official). Bob Harris cues are mostly "sneaky-pete" style cues, though not all of them. Bob's output has been "less than 10 cues per year" according to his website (this statement has been consistent on his site since at least Dec 2006). Our research suggests that the numbers would be closer to "somewhere in the range of 1 to 5 custom cues per year" between 2006 and 2014, and almost none since then. This has not been verified. The latest new Bob Harris Custom Cue seen on his website was made around ~April 2014. In an email from Bob in June 2017, he confirms that he isn't currently taking any new custom cue orders. I'm sorry, but I am not accepting any orders for one of my custom cues at this time. I can have a custom cue made for you per your specifications from another cuemaker if you want. However, Bob Harris is still active in buying, selling, and trading "highly sought after custom cues". Bob Harris Custom Cues almost all have Bob Harris' signature on the forearm (usually in a blue or black ink pen). Bob names his cues consistently as well, with date identifier followed by a sequence number indicating the cue was cue number X in that day's run. For example, a Bob Harris 011704-1 cue would be the first cue posted for sale on January 17, 2004 to the Bob Harris cues website. It is likely the date more closely represents when the cue was put up for sale vs. when it was completed, though the two dates would likely be very close, if not the same day, for most of Bob's cues. Also note that the sequence numbering isn't contiguous. For example there could be a 1, 3, 4, and 5, but no #2. This is because Bob sells other rare and custom cues on his site, and sometimes a non-Bob Harris cue gets one of the sequence numbers in between the Bob Harris Custom Cues posted that day. NOTE: This Bob Harris is the cue maker from Richmond, Kentucky. Not to be confused with the Florida cuemaker named Robert Harris who sells his cues under "Harris Cue Co.", but his designs are different enough to easily tell them apart (the Florida maker's cues have a block-style letter "H", and the Kentucky Bob Harris' cues almost always have a hand-written "Bob Harris" signature on the forearm). Bob told me a few years ago that his cues have the same taper as Mike Bender's cues do. He has Mike's old taper bars on his lathe. Bob Harris knows a lot about cues and I bet these play great. I hope I don't get you in trouble with this early bump. Bob Harris doesn't make many cues so I thought I'd share this info. Questions about Bob Harris pool cues? Something not quite correct or some info missing? Let us know using the form below.